October 14th: This morning we packed up Finehorn, fully loaded for the first time with everything we will need from now on (we hope) and headed out of Highland Ranch and on through Hendy Woods for the last time.. We made it to the Apple Farm by 5pm, and were greeted with the chaos of an afternoon traffic jam. People driving out from a day of work, delivering barrels of apples, gathering around the front deck to finish off the day of cider pressing. 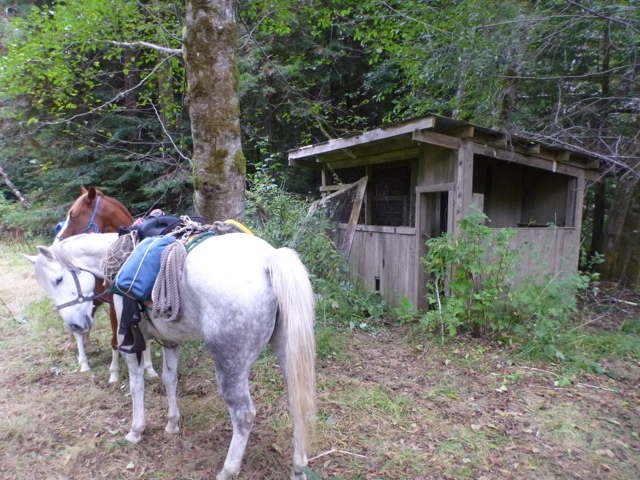 The ponies pressed down to a vacant and sleeping gypsy camp. We stayed the night. October 15th: Exhausted by a beautiful day of finding our way down the Navarro River, I am afraid tonight is not a night for sleep. 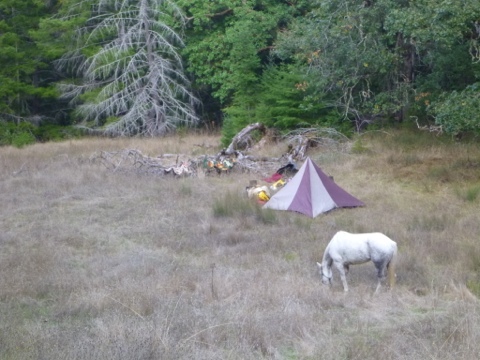 The ponies are tied short to trees outside our tent. The bearbag is finally hung after a long dilema of where it should go among all these tall, straight trunked redwoods. 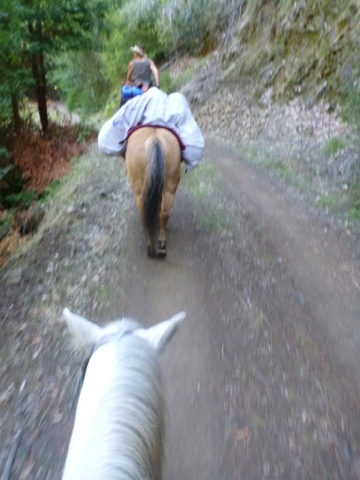 We are camped under the redwoods in a grove off of the main trail, the river is not far below us and i can hear its constant babbling among the ponie’s huffs. October 16th: Followed a beautiful trail of pineneedles and changing leaves, paralleling the river below. Made it to Capehorn and have set up camp in a saintly meadow, encircled by trees and open to the river down the rocky banks below. Finehorn and Jesse James are tethered to trees, Bacca Suerte roams free. Visions of her leaving forever, spooking and running, but we will not tether her because she has already threatened to kill herself on the rope..This is a dilema that must be tested the hard way…and she does not stray far, grazing contentedly by the others, going down to the river every now and again for a drink. There is a fire circle by our tent, driftwood has been gathered and piled around. We made a fire tonight to cook dinner over. 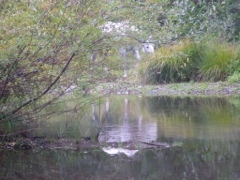 October 18th: The river was completely impassable just after Dimmick Camp Grounds. After walking the horses belly deep through the river, we found several huge trees that they could not get over. Wasted over an hour trying to find ways around the river through the brush on the South side, and finally decided that our only chance was to take 128, above us on the North side of the river. We were terrified, but Bacca Suerte proved herself roadworthy, walking ahead brave and undaunted. The others followed suit, and before long we found a trail off 128 that led us off the road and closer to the Navarro. We took this winding trail, leading us farther and farther up from the river, and started looking for a place with water to make camp for the night. We were working on manifesting the perfect camp stop: somewhere with water and pasture for the horses, and maybe even a shelter for us. It did not look like we were getting any closer to water, and just when we were about to turn around and backtrack to find water and graze, a rabbit jumped out ahead of us. Seeing this as an omen of luck, we followed it, down the rabbit hole, down: ducking under low moss covered branches and squeezing through thick brush on narrow grassy paths, into an entirely new Magical Kingdom.Soon we came out into a very strange place of seemly abandoned homesteads, Large milk trucks, rusted VW buses, wooden cabins with prayer flags, large yards of grass, and not a soul in sight or sound. We walked through this silence, feeling invisible or maybe like the world had ended. 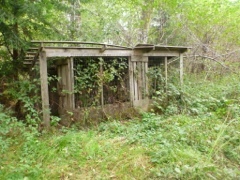 We followed the dirt road until we found an old pasture, high with good grass, fenced in except for the gate, furnished only with ancient goat sheds. We gave eachother sidelong glaces- did we dare? At dusk, as I was making dinner, a white trucked drove by our pasture and stopped. “Hi! Do you know who owns this place?” Sea inquired to the man in the truck. “That would be me,” he replied, staight faced, bemused. 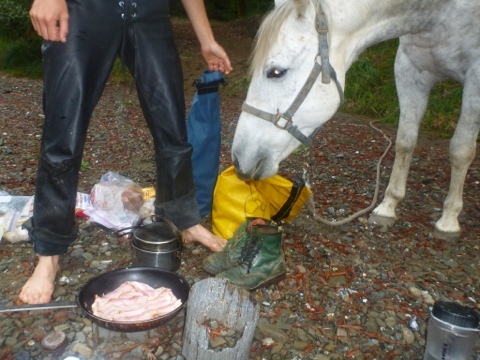 Well he was happy to let us to the camp for the night, helpful too. 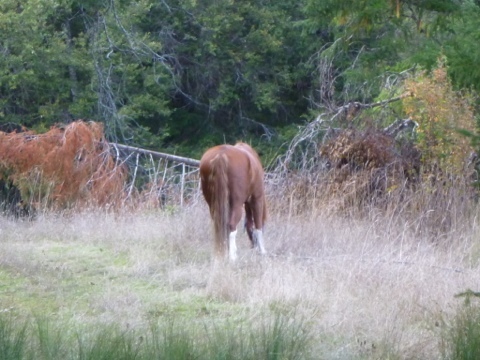 “We’ll be gone in the morning.” We put up white tape over the open gate, and the ponies have plenty of graze tonight. 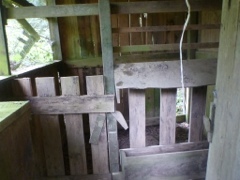 We have layed out on our bedrolls in this tiny stall of this ancient and abandoned goat shed. Only a mile from the ocean, as it turns out. October 19th: Packed up and walked the last mile to the Ocean today. It was a windy day, and road to the ocean was closed due to flooding. 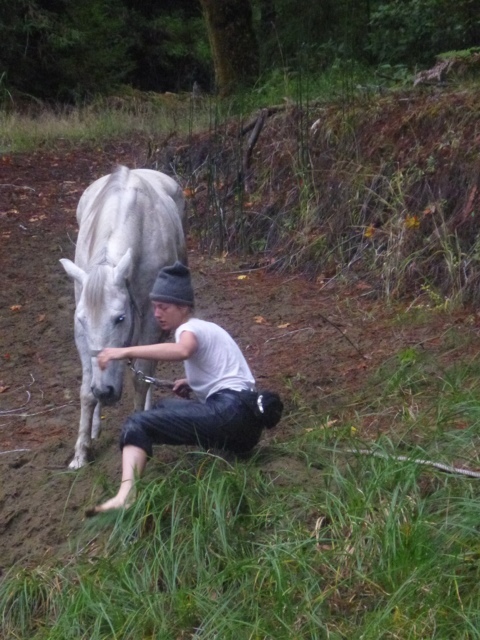 We rode our ponies knee deep through the washed up pools to reach the shore. The winds were strong and we did not stay long- the windy openness of the ocean seemed to make Bacca Suerte wild eyed and insane. Arrived at Dimmick and are camping here tonight. We had already knew the way this time and it was the first day with did not waste time getting lost. 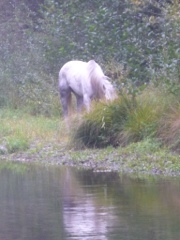 We tethered the ponies down by the river to graze, except for Bacca who was free to cross and eat the grass on the other side. Moss came to visit us bearing oat and apples. October 21st: I went on a provision run to Navarro General Store this morning. By afternoon we set out on 128 to catch Masonite. Stopped by the MRC office and received topo maps and suggested routes, still took a wrong turn early out and got desperately lost. Spent the day bushwhacking up a mountain, Fine Horn jumping logs and scurrying around cliffs fully packed, all of us sore and sweaty and wide eyed in the middle of nowhere. We decided that we really had no choice but to turn around when we came to an impassable landslide. We turned around, almost defeated, and slogged back the last rocky steep and brambly 4 and half miles with the setting sun. At around 6pm we came across a boy scout camp. Camps with wood platforms and canvas tents, all empty (or so we thought). 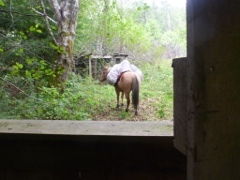 Ham + cheese sandwiches for dinner, ponies tied to a hitching rail, and we curled up in our pup tent and went to sleep. I awoke in the middle of the night to the jingle of a bear stick and adolescent male voices and knew we where not alone. October 22nd: We woke early and dressed, fighting the dawn dew. We soon learned that boy scouts were occupying a camp down the way, and it turned out that today is the day they planned taking down all the tents and packing up for winter. They let us stay anyways and we moved into a larger open wood bunking house. They offered us hot showers and a drier. I gave Bacca a bath in the watering trough. The first official day of rest since we started this trip. Blessings on the boy scouts! October 23rd: Started down Flynn hills again, minding not to take the wronge turn this time. Up a crazy ridge and successful, trails with gorgeous views taking us to the top of the World and back down again following red dirt roads. The vision of the trip is how i think of those trails. Bacca had a buoyancy to her step, and we shifted from steep hot hills into shady groves. Half way through the day, the hills started to seem endless, the sun scortching, and the water no where to be found. we got lost trying to get back onto Masonite Road. The topo map was not making sense no matter how much we backtracked, so we switched to the compass for a guide. 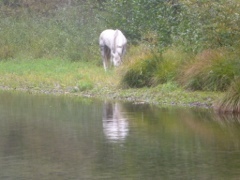 The horses had to drink from puddles. The sun set burned too bright as we made our way through the brambles and to a gate labled Baily Ridge. Walking after dark along a road we could not name, we finally found a pull off spot off the road and made a dry camp. No graze, no water, greasy sausage and cheese for dinner. YUK! Needless to say, we were all dehidrated, frazzled, and bone-weary. October 24th: Found the connect back to Masonite (Wohlys Pass), the MRC maps turned out to be aslant. Long day on logging roads with no water still. We had to get permits prior to walking Masonite by John Remaley – who turns out to be a trail angel! He found us around 3pm and brought us water bottles from his truck and opened up a gate .7 miles ahead of where we were, giving us the key and combination of the Enchanted Forest. We arrived into open pastures bordered by oak groves, and a small creek down a steep hill. We camped for the night in this beautiful basin of grass, the night was cold and scarey and Jesse James stood guard protecting us from the wild pigs close by in the dark forrest beyond. 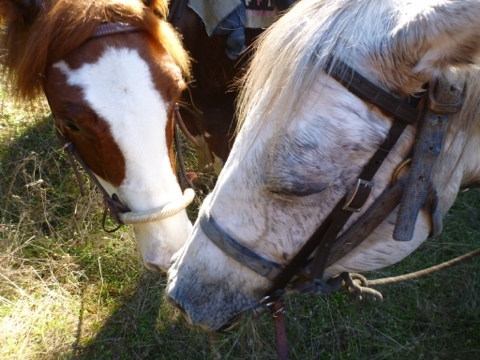 October 25th: Bisquits for breakfast (Finehorn loves biscuits and sausage, hell she even eats lighters – that pickpocket) Then i kicked up a hornets nest down by the creek while leading the mares to drink. Jesse James, sensing trouble, started a stampede and got everyone out before i even deemed the problem. They stopped when they got to the meadow and let us know they were not going to make a run for it. I got stung once on my neck. We set off and walked the 8 remaining miles to Ukiah. The leaves are turning gold and crisy brown and floating down among us as we ride. The air bites with a fresh wind of impending winter. 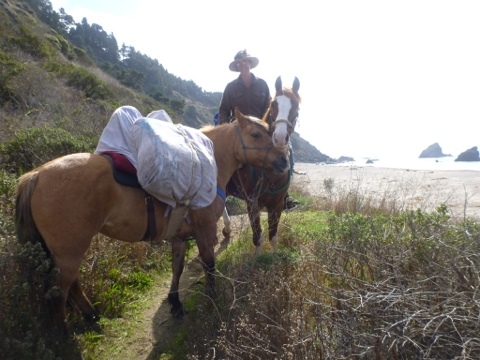 Finehorn has found her calling as a packhorse and has become the roots of our gypsy ways. Bacca Suerte is calming down noticably and is happily becoming my horse. She is like a snake to ride, always moving with the quickness of water. She has hooves of steel and may be a metal angel. She is losing weight, though, and i am trying not to worry about her. I have to remember, this is a miracle- Jesse James is the only one with conditioning, and they are all doing so well, working so hard. Becoming one with the herd, I have stepped out of time. The Ending of the first chapter. 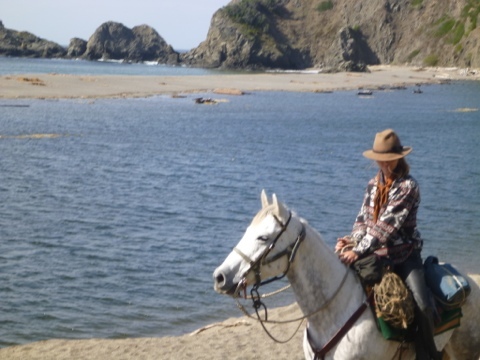 This entry was posted in Uncategorized and tagged Cape Horn, Dimmick campground, dry camp, Hendy Woods, hornets nest, magical kingdom, manifesting, metal angel, Navarro River, one with the herd, pick pocket pony, trail angel. Bookmark the permalink. We loved having you here at White Rock Ranch in yucca valley, california. I will contact you with any connections I may have about places to bed down on your journey.